Day four saw Davin and I deciding to camp out in Tav and just wait it out. If you are trying to move around to find a fish that moves around, you stand some chance of missing the fish every time. If you wait, so the thinking went, the fish will have to come to you. It was a good theory. The weather was grey, the water was hard to see anything in, the wind was up. In short, not ideal. This proved to be the closest I would get to my oceanside tarpon. Davin, it turns out, sold his soul (at least a part of his soul at any rate) to gypsies in return for super-human vision. He was calling out fish for me on a day when I couldn’t see a damn thing. He must have seen 100 fish that day, I saw about 8. I was making casts to fish I couldn’t see, but Davin and I were working like a team and we were working well. Three follows. That was the grand tally for the day. 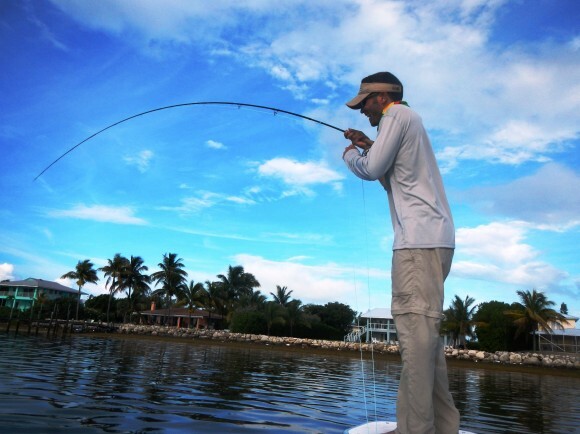 “Tarpon fishing is a game of incremental victories,” said Davin, and that is certainly true. The fish you see. The fish you cast at. The fish that follow. The fish you get to eat. The fish you jump. The fish you land and release. On a bad day you count it all. On a good day? I’ll let you know when I have one. At one point we got chased off the water by a wall of watery darkness, managing to run under the protection of Nate’s awning just as the squall hit. We went back out, but the tides had changed the fish stopped moving (or moved further out where not even Davin’s gypsy purchased vision could find them). Davin got to cast for about 5 minutes and had one shot in that time. He let me stand up there for hours, willing me to connect, but the fishing gods had other plans. Either that or this was the fishing gods’ plan and they are a bunch of jerks. Another day, another smack down, but a good day on the water. I felt like at least I was in the game and that was more than I had felt the previous few days. Funny how I could feel mostly content on a day when I didn’t touch a single fish, but I did feel content. I took the small victories and was happy with them. 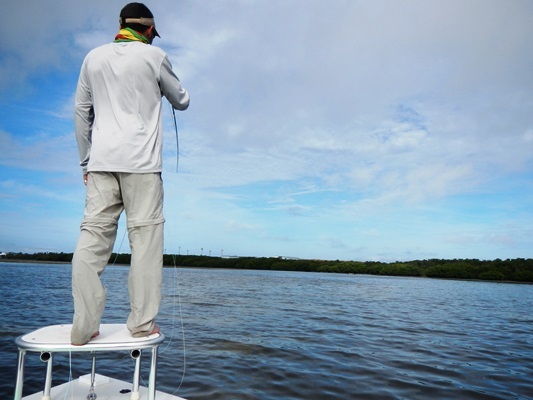 On this FL tarpon trip every shot gained in magnitude and importance because there were so few of them. So, each flub was a massive failure, bringing down the skies and ripping out a bit of my soul (to be dramatic about it). One of the problems I had was on that first cast to really close in fish. Conditions meant we didn’t see fish from too far away. Often we’d see the fish 30 feet away, maybe 20, sometimes 10. Always they were coming at us, closing the distance fast. Trying to get a cast at a 100 pound fish 20 feet away is harder than it sounds on the face of it. The rod is 9 feet. The leaders were were fishing were between 10-13 feet. That means your cast, if you can call it that, was basically the length of the rod and the leader. Ever try to load a 12 weight with no fly line out? Or even just a couple feet? It doesn’t work so well. You can’t load the rod and you can’t make the cast. On the first cast, everything would fall apart and then… oh calamity. In retrospect, I should have shortened the leader so I could have more line out, so I could have loaded the rod for the super-close-in shots we were getting. A 13′ leader is a clear-day luxury we didn’t have, but tried to insinuate into the situation. It was the wrong call. The second lesson, which will be learned and re-learned a hundred times over an angler’s life is simple… when it feels like you need to speed up, that’s exactly when you need to slow down. Take out the panic and get methodical with it. Think mechanics, not fish, and concentrate on the movements of your hand, your arm, the rod, the line, and not the movement in the water of that shot evaporating in front of you. If you don’t get it right, it doesn’t really matter if you had a shot or not and you won’t get it right if you panic. Speaking of casting, here’s Davin, aka Windknot, aka Flatswalker, talking about another bit of casting that he diagnosed me with and that I tried to get right on my last couple days. It had been a while since I had wandered over to Flatswalker and what do I see when I get there? All manner of goodness. Example? Sure. How about this post, with some casting tips. Really, he’s got loads of casting tips on there and you should check it out. 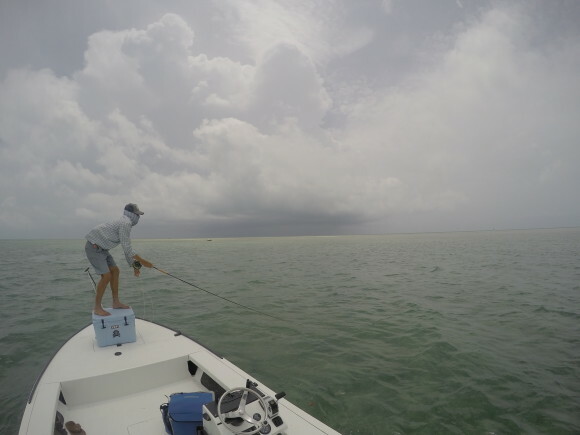 Davin will be in the Keys here in a month and we’ll fish together again and that is good. Before you take that trip of a lifetime… spend some time getting your cast straight. Pity to go allllll that way and then have the wind kill your trip. There is wind. Almost always and even if there isn’t wind, there will be and it will blow so hard and you’ll think “I can’t cast in this!” and you’ll be right if you don’t work on it. Maybe you can lay out some line when throwing that caddis out on the lake or that 30′ cast on the big river, but the flats are not like that. The wind is sometimes unrelenting and sometimes right in your face as the fish are coming at you. The wind can be your friend. The chop makes the fish feel a bit more comfortable. It can mask your movements and your noise. A windless day is tough, sometimes tougher than a really windy day. Wind is a reality. Learn to cast in the wind. It is a skill you can pick up and you can remove that from the list of limiting factors. So… Mr. Windknot, take it away. Flatswalker is good stuff. Recently, he went to Acklins and, luckily, he wrote about it. I reach the hotel bar: dry, plainly furnished, with a quartet of anglers drinking in the corner. In place of a bartender there’s a ledger with a number of hash marks. Ah. The honor system. There’s a picnic cooler with an assortment of beer. A little digging surfaces a Kalik and after the first swig I feel my hopes rising. Surely the weather will clear to the east, right? Bound to. Surely. Ah…. always enjoy a bit of goodness from Flatswalker. To really know such places requires time, and memory is built slowly, in layers. It is accreted, like the new sand of a high tide or the detritus of a storm. There is meaning there somewhere. Love the smile here. This stuff is fun. 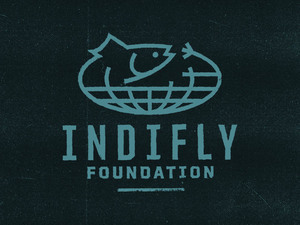 Yesterday’s post was about the DIY debate from This is Fly. Flatswalker waded (see what I did there?) in with a thoughtful reply. Some good stuff there. Go read it (please). If you’ve been around the blog for a while you know that I have a lot of respect for the Flatswalker blog. I dig his work and his writing. Davin was one of the writers in the first Pulp Fly and he’s a guy I’ve been in touch with over the last few years. So, it was great to find that he could make the Florida trip happen. I’ve never met him, although we’ve talked on the phone a few times. That’s one of the great things about this trip… getting to fish with folks I’ve wanted to fish with. Davin is one of those guys and don’t worry Davin, I’ll bring a rain jacket. I was going to do a review of the RIO Quickshooter Bonefish Fly Line. Then, I read the review of said line over at Flatswalker.com. He crushed me both in time to evaluate the line, useful insight into what makes the line work so well and word-count. Basically, a line should do what the box it came in advertises. It doesn’t have to have some trippy nano-texture copied from a Jesus Lizard or slide through the rod guides faster’n a greased up snake. It just has to not tangle, load the road and not fall apart too soon. Classic. Read the rest of this too. If you look riiiiiiiight there, you can see the Quickshooter line. The idea behind the Quickshooter is this… when you need to load a rod quickly, especially the ultra-fast rods you find on the flats today, you need a line capable of loading the rod with very little line out. 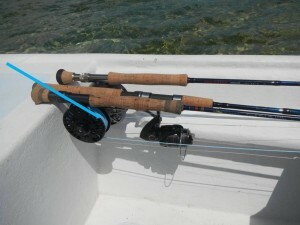 This is a wading line for when you see the fish at 30 feet and need to send something pointy down range quickly. I can say it works. Two of the fish I caught were while wading and one was probably about 35 feet away. I had no problem loading the rod quickly and making the shot. I’d say I think the line is slightly less ideal for fishing out of a boat on a windy day when you want to keep line on the deck. The thin running line can get a bit FUBAR if not watched closely or if you are fishing with flats beginners who don’t understand their role in keeping your line from birdnesting. I like the line and will fish it in the future for sure, especially if I think I’ll be doing a lot of wading. *This line was sent gratis by RIO.